The wreck of a large iron steamship lies four miles south-south west of St Alban's Head on the Dorset coast; the wreck site being well known but not regularly visited. Those who have been there may know it by various names and popular dive guides refer to it as Start or Hartburn. It is unlikely that the wreck in this position is either of those vessels. Using information gathered from both the current day wreck site and referring back to original documentation numerous other possible candidates have been identified and eliminated. This leads to the conclusion that the identity for this shipwreck is Netley Abbey sunk by collision with HMS Surprise in 1899. 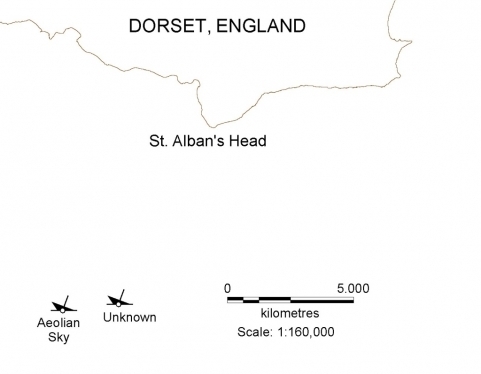 Four miles SSW (202.5º) of St Alban's Head on the Dorset coast lays the wreck of a large iron steamship. About one mile to the east of the more recent and popular wreck of the Aeolian Sky this dive site is well known but not regularly visited. Those who have been there may know it by various names, the most likely being the Hartburn or the Start. Despite the indication that the wreck has not been positively identified, clear hints on how to make a more positive identification and there being no evidence of rail trucks amongst the wreckage; hundreds of divers now believe they have seen the Hartburn. The Shipwreck Index of the British Isles  lists the position of this wreck as the Start although the Start has been positively identified from the recovery of the ship’s bell and lies some 10 miles further east. The actual location of the Hartburn is a little less clear. Dorset Shipwrecks suggests the Hartburn lies much further east where there is a wreck matching the description of the Hartburn and containing railway trucks. This now seems equally unlikely because recovery of ships crockery has identified this wreck as the Azemmour, as reported in South Coast Shipwrecks off East Dorset and Wight 1870-1979 by David Wendes. This same book suggest the Hartburn is one of two wrecks lying some 10 miles east of the wreck off St. Alban’s Head, much closer to the original reporting sinking of the Hartburn. 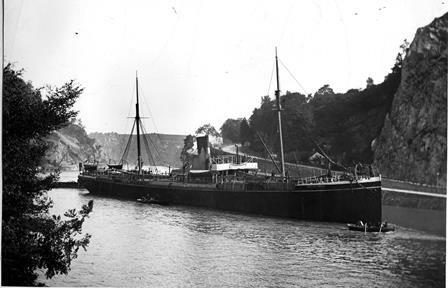 A number of admiralty papers relating to SS Netley Abbey were located in The National Archive because she sank in collision with an admiralty vessel, HMS Surprise. A copy of a telegram sent from Spithead to London on the 5th August 1899 reads “At 4:25pm yesterday Surprise being then about 3 miles south of St. Albans Head collided in fog with collier Netley Abbey from Cardiff. Collier sank crew of 24 all saved. Surprise arrived Spithead 0:30 this morning and has just gone into dock. Water in ships forward to 16 station but apparently ship not as badly damaged as might be expected. Further particulars damage later. Hope send report on collision tonight post. Owners of Netley Abbey Pyman Watson & Co Cardiff.” This position was within one mile of the position of the wrecksite being researched. Using information gathered from both the current day wreck site and referring back to original documentation numerous other possible candidates have been identified and eliminated, however, the proximity of the wreck to the positions stated by the Captains of both SS Netley Abbey and HMS Surprise strongly suggest that the wreck is that of the steamship SS Netley Abbey sunk after collision with HMS Surprise on Friday 4 August 1899. A series of dives have confirmed the general layout of the wreck is consistent with the layout and features of SS Netley Abbey including the number and position of the masts, the cargo, boilers, engine and position of davits and deadeyes for rigging. Measurements of the wreckage, engine, boilers and deck mast steps agree with those recorded for SS Netley Abbey and confirm its identity. Given the proximity of the wreck to the positions stated by the Captains of both Netley Abbey and HMS Surprise, and the similarity of the wreck to the layout and details of Netley Abbey it is concluded that the wreck lying at 50°30'.8 N 002°06'.5 W is that of the steamship Netley Abbey sunk after collision with HMS Surprise on Friday 4 August 1899. 4. R. and B. Larn, Shipwreck Index of the British Isles Vol., 1 Lloyd’s Register of Shipping, (London, 1995). 5. Hinchcliffe & Hinchcliffe, Dive Dorset, S. Shovlar, Dorset Shipwrecks, (Poole, 1996), D. Wendes, South Coast Shipwrecks off East Dorset and Wight 1870-1979, (Wight Spirit Charters, 2006).